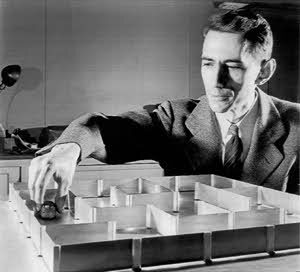 Claude Shannon's clever electromechanical mouse, which he called Theseus, was one of the earliest attempts to "teach" a machine to "learn" and one of the first experiments in artificial intelligence. 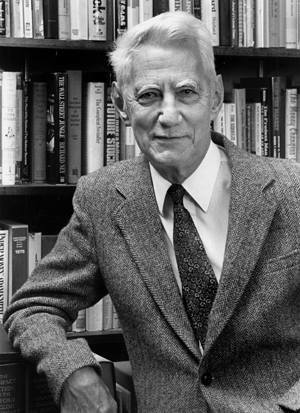 Murray Hill, N.J. (Feb. 26, 2001) -- Claude Elwood Shannon, the mathematician who laid the foundation of modern information theory while working at Bell Labs in the 1940s, died on Saturday. He was 84. Shannon's theories are as relevant today as they were when he first formulated them. "It was truly visionary thinking," said Arun Netravali, president of Lucent Technologies' Bell Labs. "As if assuming that inexpensive, high-speed processing would come to pass, Shannon figured out the upper limits on communication rates. First in telephone channels, then in optical communications, and now in wireless, Shannon has had the utmost value in defining the engineering limits we face." In 1948 Shannon published his landmark A Mathematical Theory of Communication . He begins this pioneering paper on information theory by observing that "the fundamental problem of communication is that of reproducing at one point either exactly or approximately a message selected at another point." He then proceeds to so thoroughly establish the foundations of information theory that his framework and terminology remain standard. Shannon's theory was an immediate success with communications engineers and stimulated the technology which led to today's Information Age. Shannon published many more provocative and influential articles in a variety of disciplines. His master's thesis, A Symbolic Analysis of Relay and Switching Circuits, used Boolean algebra to establish the theoretical underpinnings of digital circuits. This work has broad significance because digital circuits are fundamental to the operation of modern computers and telecommunications systems. Another example is Shannon's 1949 paper entitled Communication Theory of Secrecy Systems . This work is now generally credited with transforming cryptography from an art to a science. Shannon was born in Petoskey, Michigan, on April 30, 1916. He graduated from the University of Michigan in 1936 with bachelor's degrees in mathematics and electrical engineering. In 1940 he earned both a master's degree in electrical engineering and a Ph.D. in mathematics from the Massachusetts Institute of Technology (MIT). Shannon joined the mathematics department at Bell Labs in 1941 and remained affiliated with the Labs until 1972. He became a visiting professor at MIT in 1956, a permanent member of the faculty in 1958, and a professor emeritus in 1978. Shannon was renowned for his eclectic interests and capabilities. A favorite story describes him juggling while riding a unicycle down the halls of Bell Labs. He designed and built chess-playing, maze-solving, juggling and mind-reading machines. These activities bear out Shannon's claim that he was more motivated by curiosity than usefulness. In his words "I just wondered how things were put together."